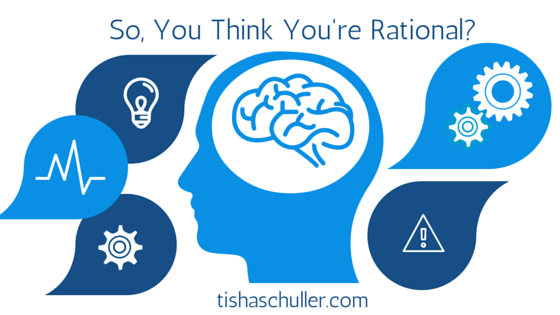 Tisha Schuller: So, You Think You're Rational? So, You Think You're Rational? It’s taken a long time for me to admit that a key error underlying most conflicts over energy and the environment is the presumption that each of us behaves rationally. I assess my position with facts and figures, drawing the best conclusion. And I assume that others are doing the same. So the energy wars are waged wielding those facts and figures. Even among conspiracy theorists, arguably the least rational among us, their conspiracies are built carefully upon the facts and figures that describe the motives and plans of the agents of the conspiracy. It turns out that science also tells us it is nearly impossible for a human to digest the fact that we are not behaving rationally. So don’t bother! I will assume that I am behaving rationally. You may assume that you are behaving rationally. But to effectively communicate amid the energy wars, it is critical that you have a basic understanding of the irrational decision-making framework of others. If your job involves engaging with others in outreach, community engagement, decision making, or conflict, it is useful to understand what we really have to work with. Too many of us have spent our careers collecting, analyzing, packaging, and repackaging facts for the consumption of our audiences. Assuming that facts and figures will wins hearts and minds is fundamentally flawed. Here is some basic guidance. I’m not a psychologist or social scientist, so I invite those who are to critique this summary and provide updated sources. I’m just an environmental scientist who engages in a lot of heated debate, and as a result I have made a study of understanding how to navigate this minefield of data and emotions. We have two ways of engaging our mind in a given a situation: Kahneman1 describes these as system 1 and system 2. System 1 makes quick, intuitive decisions about the material before us. System 2 engages in discerning analysis. The important thing you need to know about this is that most of us are operating in intuitive mode (system 1) most of the time. And in that intuitive mode, we bring all kinds of biases to the table to help us make sense of our world. An example of a bias is the affect heuristic where people make decisions based on how they feel - Do I like it? - and then assign rationalizations to support their emotional preference. Think about your last car or clothing purchase, and you’ll get an idea of how the affect heuristic affects your thinking. So, most people you’re engaging with think they are making rational, discerning assessments of their world.But really, they are quickly processing the available information and making intuitive decisions. A result of this reality is that people are gathering scientific information about energy and environmental problems and making very cursory, intuitive judgements. The result is the massive, partisan and value-driven divides we have over hot-button issues like climate change and fracking. I’m happy to spend more time on this in a future blog, just let me know you’re interested. What I’d like to cover here, is: how does this inform how you engage with others on energy and environmental issues if you want to have an intelligent, informed conversation? You may be motivated because you are implementing outreach for a project or because you simply want to have intelligent, informed conversations2. How do you engage with others on energy and environmental issues? Acknowledge the emotional, irrational nature of the playing field. It is actually empowering when you give up on the idea that the best facts will win. They won't. Understand that relationship building is primary, science and data-based discussions are secondary. Your obligation here is to be an interesting, engaging human being, not a data-driven robot. Get to know the people with whom you are engaging, and be curious about what informs their point of view. The more you engage the person and build rapport, the more likely that you will be able to introduce facts and figures to the discussion later. Cease imagining that you will ever change anyone's mind. Yes even you, engineers! Despite what many of us have imagined over the course of our lifetimes, we do not engage in conversations to change people's minds. We engage in conversation to build relationships. Do you like someone trying to change your mind? Plan on multiple conversations and multiple iterations on your engagement approach. The best process of engagement starts, stops, and continues; it goes backwards, forwards and then forward some more. If you are charged with informing a public group in an outreach project, plan multiple meetings so that participants can digest what you have to say without having to get dug in to their own opinion. A series of engagements allows for the more subtle process of building rapport and trust. Listen and understand, to inform your next conversation. Iteration is only helpful if you are seeking to learn from your audience. You will grow your perspective along the way, and this will help you build more interesting and subtle perspectives on the issues. Beware! You will learn something too. Allow for breaks. Once you understand the emotional and intuitive nature of decision making, you can recognize the importance of letting people go away and reset to some extent. You also need time, because inevitably your positions will change as well. It is unlikely that many of us will admit that we do not behave rationally most of the time. But we can become agents of constructive change by participating more thoughtfully in difficult conversations about energy and the environment. This blog is dedicated to the fine men and women of the Southern Gas Association environmental conference who inspired it with their excellent questions and insights. 1The best book I know of on this subject is Thinking Fast and Slow, by DanielKahneman. Feel free to suggest others for reference here. Your writing is very insightful, Tisha. My experience is in small town and regional politics. Many times I made the mistake of thinking I could convince people with facts or logic. I eventually learned and usually remembered that it is much more productive to tell people what they want to hear (no lies) rather than trying to tell them what you think they should hear. It puts you on the same team where most will work with you rather than counter to you. To remain honest you really need to be modifying your own positions as opposed to simply saying what will garner you votes or support.